Put oil in the pressure-cooker. Heat the oil till smoke is coming. 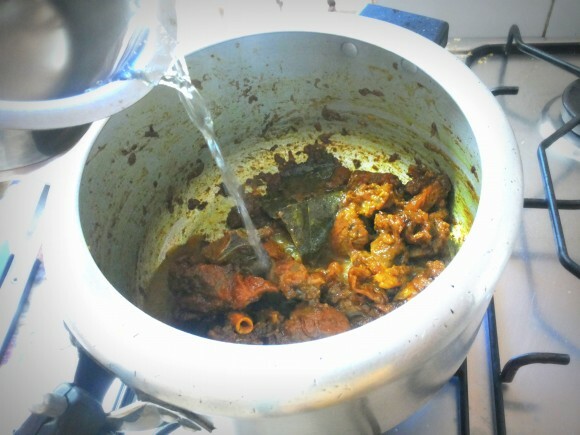 Put clove, bay leaf, cumin seed and 4 pods of garlic, fry till garlic pod become light brown. 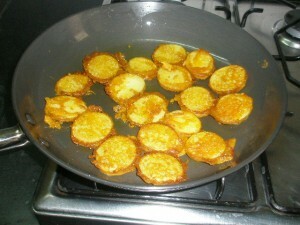 Add chopped tomato, ginger paste, and fry it about 3-5 minutes. 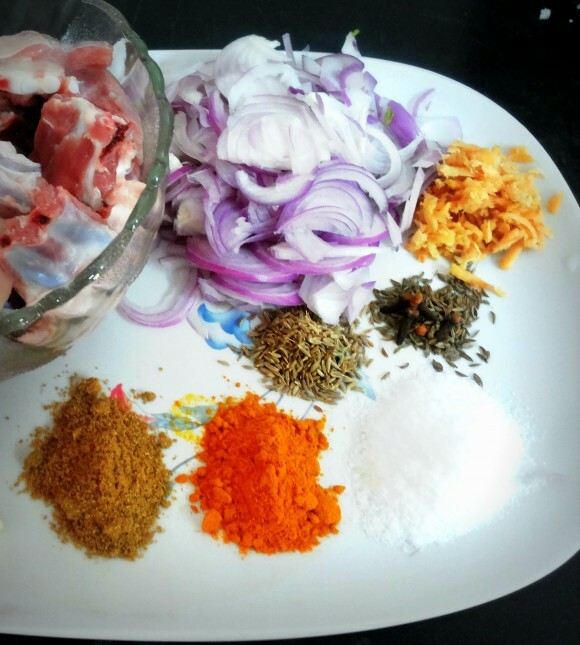 Add mutton, chilly, coriander powder. Reduce to low flame. 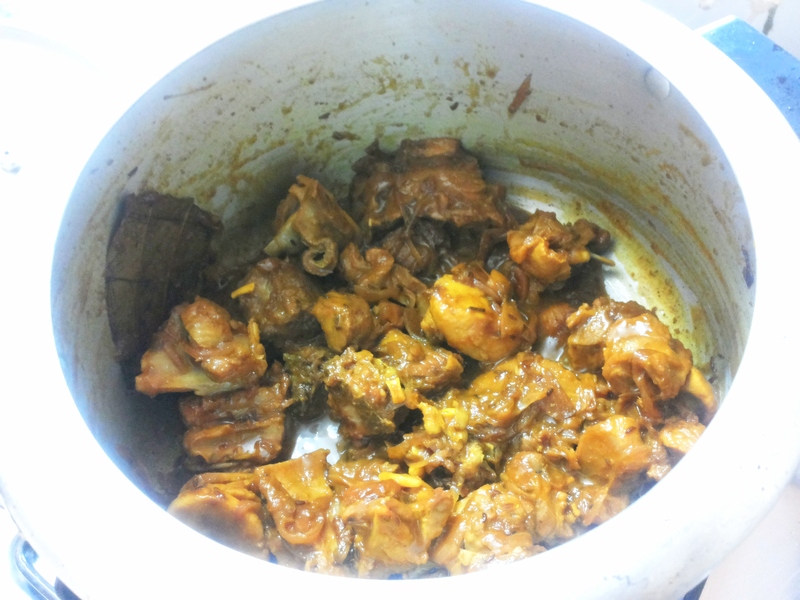 Fry mutton till liquid dries up (about half an hour). Add salt and continue to roast for another 5 minutes. Add hot water. Close lid and bring to full cooking pressure. 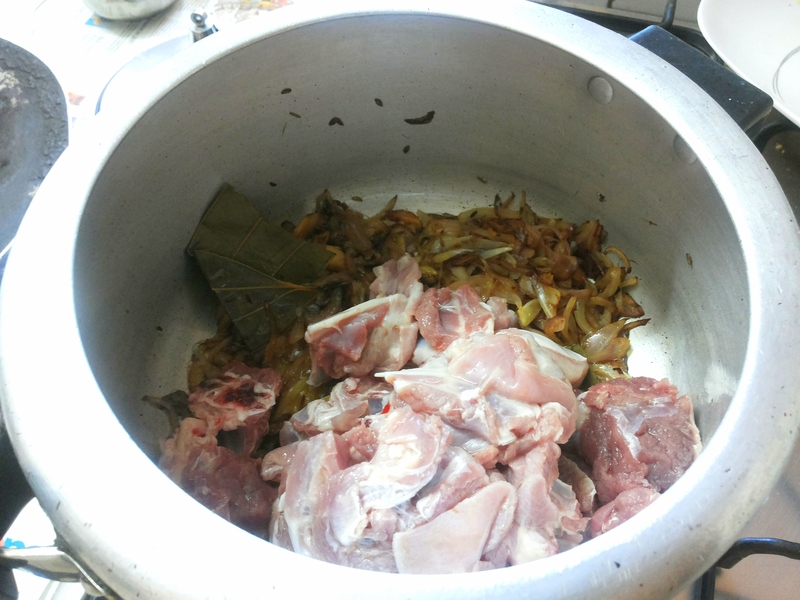 Reduce to lower heat and cook for10-12 minutes. 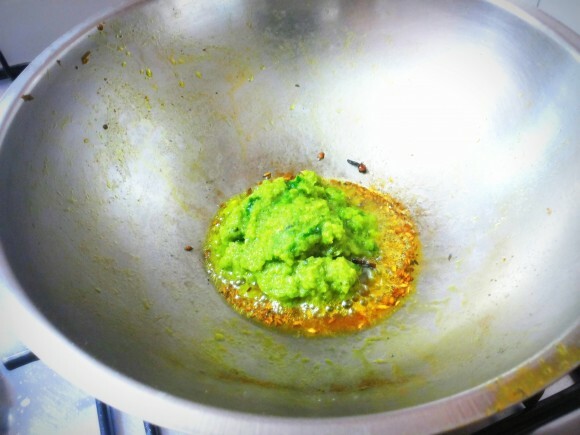 Add Garam masala powder ghee and chopped coriander leaves. 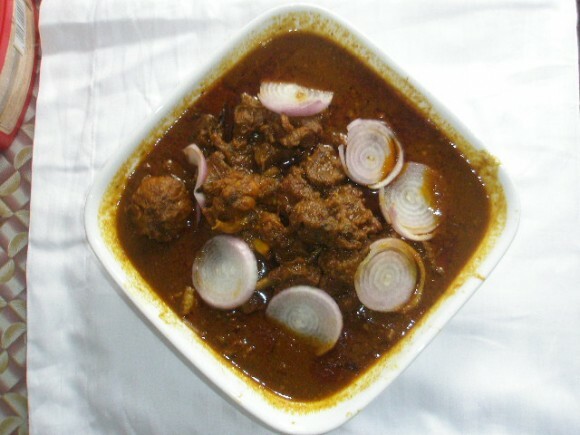 Among the numerous styles of cooking mutton, the simple pressure cooked home-made mutton is a favorite to my family since it always brings back the familiarity of style, taste and aroma that they always relate to. Not to understate, the simplicity with which this recipe is cooked makes it a frequent flyer on the dining table. 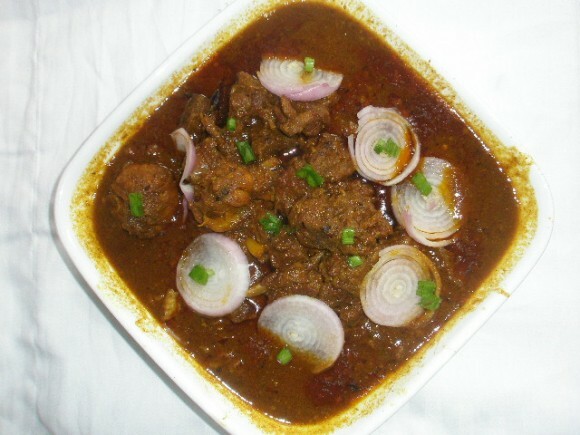 Garnered with rich spices and tangy whole garlic in the thick gravy, it blends beautifully with buttered flat breads/rotis or with hot steamed rice. 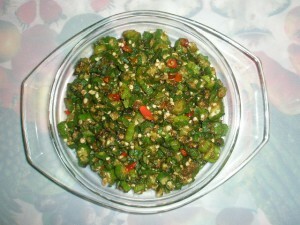 Clean and wash bhindi. Dry them with kitchen towel. Trim the both ends of bhindi, and cut into one inch pieces. Heat 2 tablespoon of oil in a fry pan. 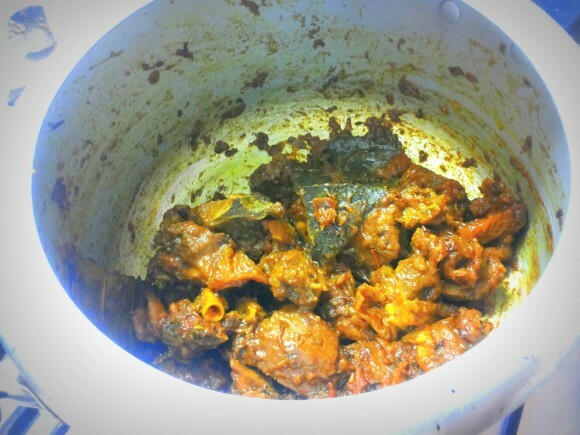 Add ajawine, when it turns brown, add garlic paste. Stir it and add bhindi in it, and sauté on high flame. 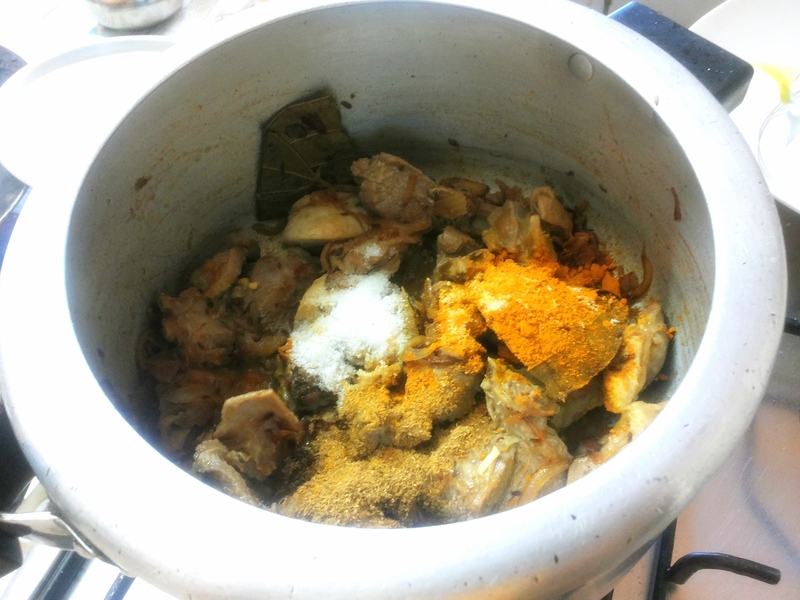 Add chilly powder, coriander powder, turmeric powder and aniseed powder. Fry till bhindi is done. 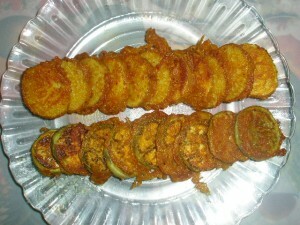 Now bhindi fry is ready. Garnish with chopped green chilly and coriander leaf. Don’t over cook as the bhindi will get mushy. 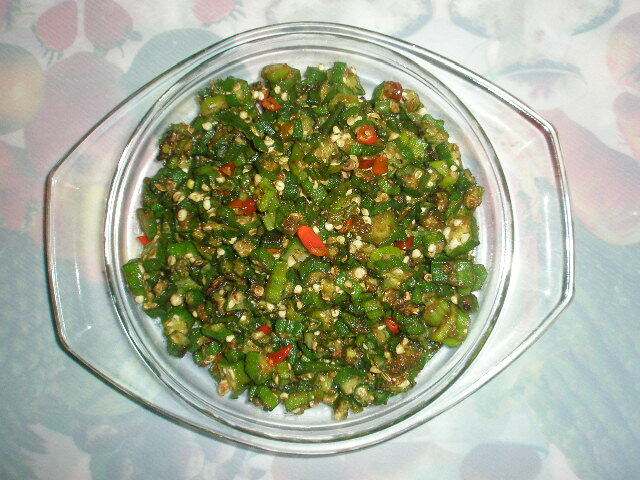 Bhindi (lady finger) is ready to serve. 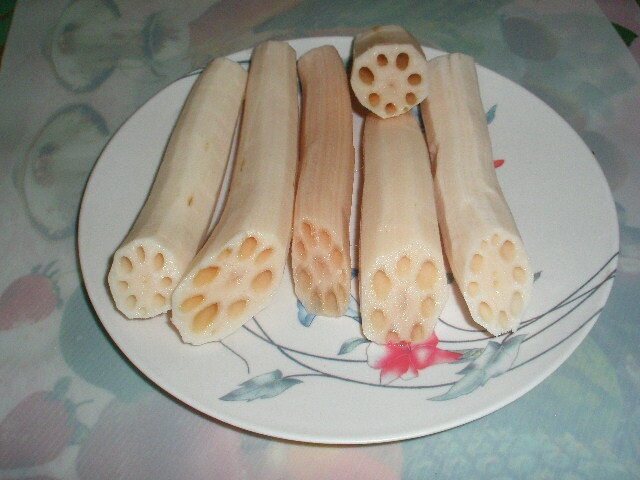 Cut the lotus stem into 4 to 5 inch long pieces. Put it into salted water bowl. Put the lotus stem into cooker with 2 cup of water, half teaspoon of salt and 1teaspoon of lemon juice. Place cooker on high flame, and bring to full cooking pressure. Reduce the heat on low flame and cook it about 10-15 minutes. Drain the water and wash the pieces under tap water, clean properly and keep aside. 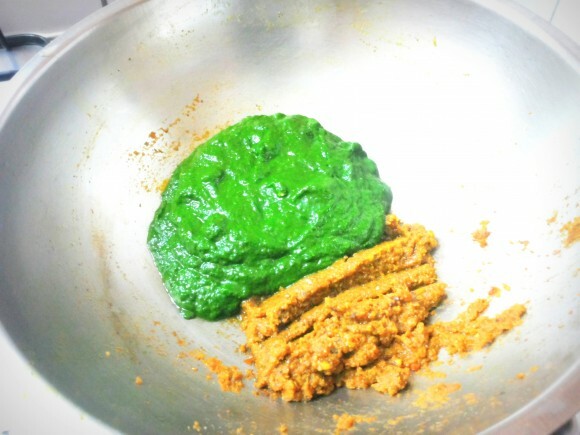 Add besan, chopped coriander, green chilly, cashew nut and salt combine all ingredients in a bowl, mix well to make dough. Shape it in small ball. 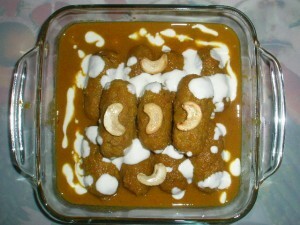 Heat the oil in a kadhai and deep fry the kofta (ball) till it turns golden brown in color from all sides. Keep aside. 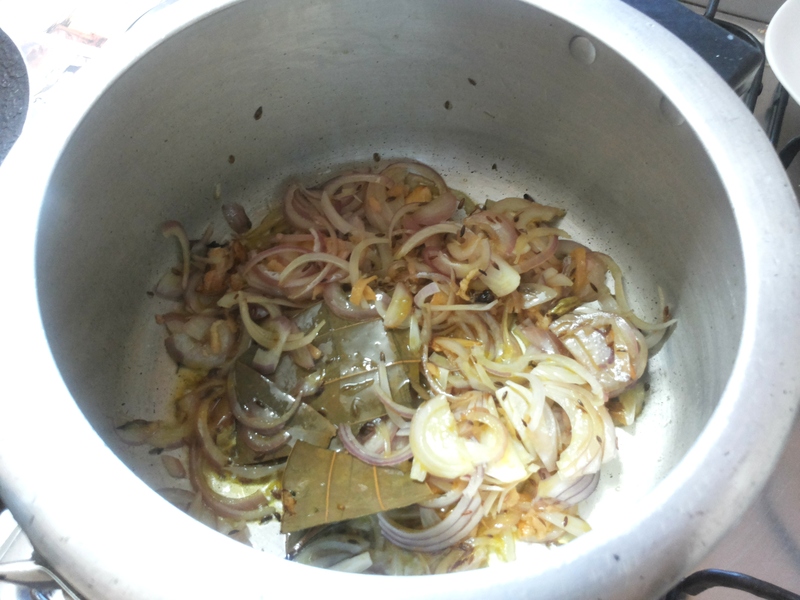 Add onion paste and sauté on high flame till golden brown. Add grated tomato and continue to sauté for 3-5 minutes. 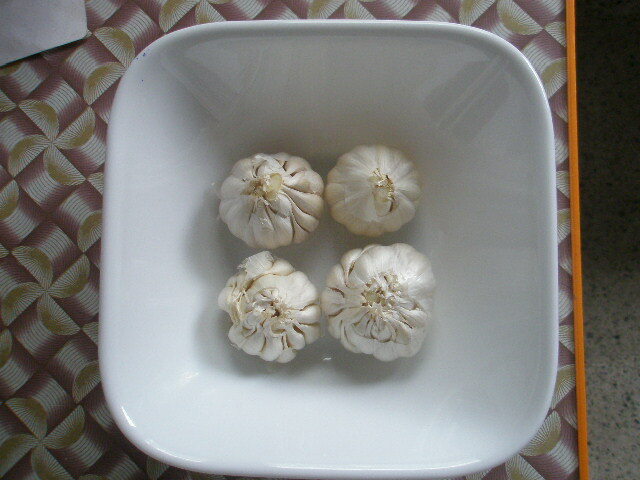 Add garlic and ginger paste. Stir it. Add 400 ml water and cover the lid. 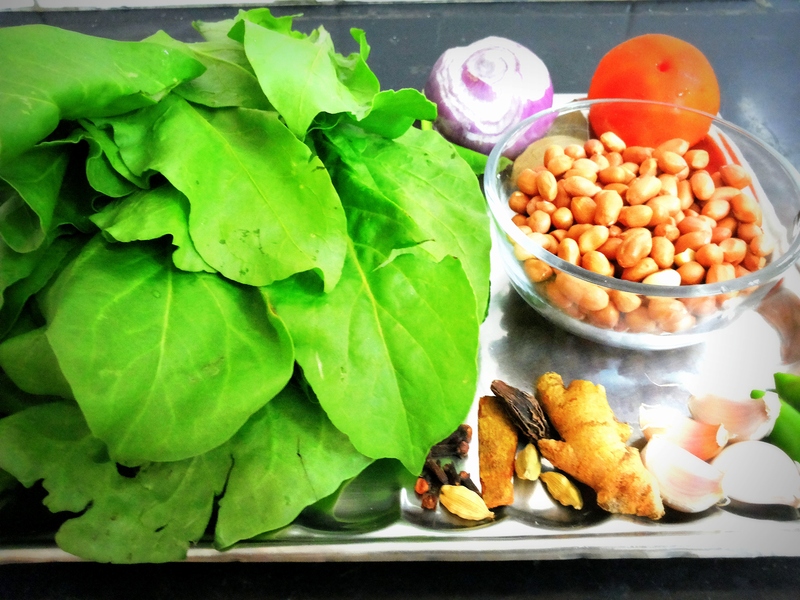 Garnish with coriander leaves and fried cashew nut. Rice flour/chick pea flour: 3 tablespoon. (With rice flour it will be crispier). Cut the potato into 3mm-4mm thin slices in a bowl filled with water. 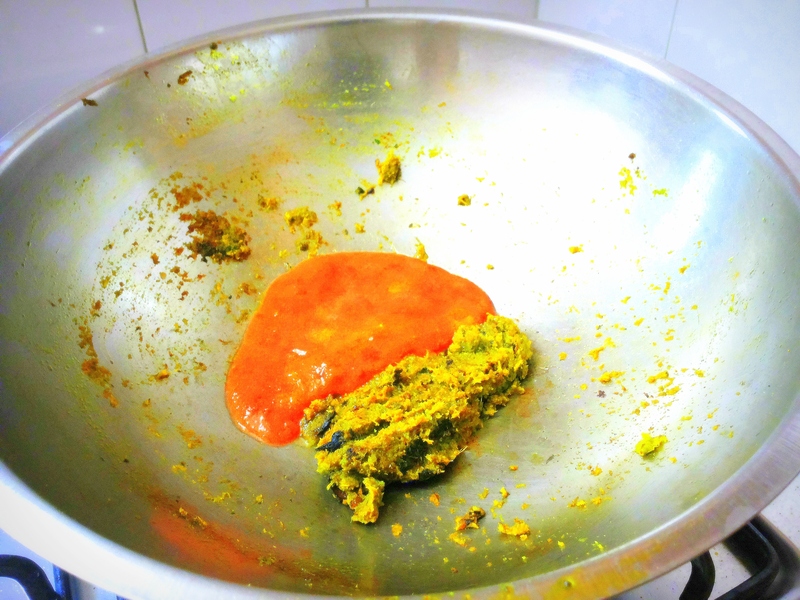 In a shallow bowl, mix the flour with red chilly powder, turmeric powder, salt, coriander powder, Garam masala powder, garlic paste, ginger paste, onion paste mix with water. Make the thick batter. Coat the slices (both side) of Brinjal and potato with the batter. Heat one tablespoon of oil on a non stick fry pan, spread it. When smoke starts coming. Spread the Brinjal and potato in fry pan. Add few drops of oil if required. Repeat till all the slices are cooked. Serve immediately while it is crisp as a side disc. Today’s recipe is a short tale. 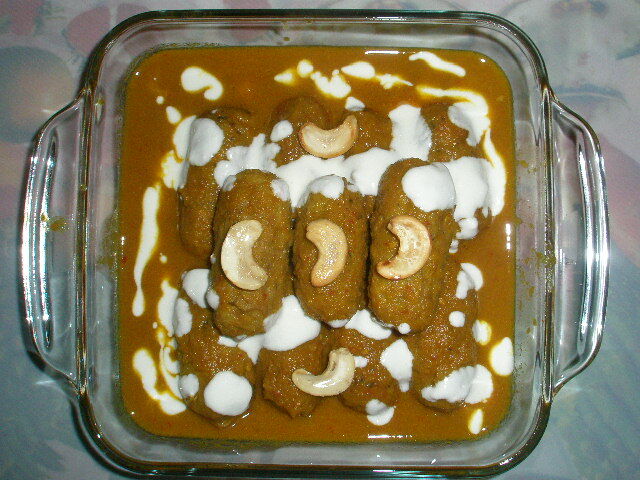 A tale to tell you that how a simple thought can make a beautiful message, a delicious recipe. This is about Spinach & Groundnut. Huh? Who could think of this combination..? But did I tell you, I thought so much so, still just obstinately wanted to prove myself that this would come out beautiful, and guess what? It tasted wonderful. 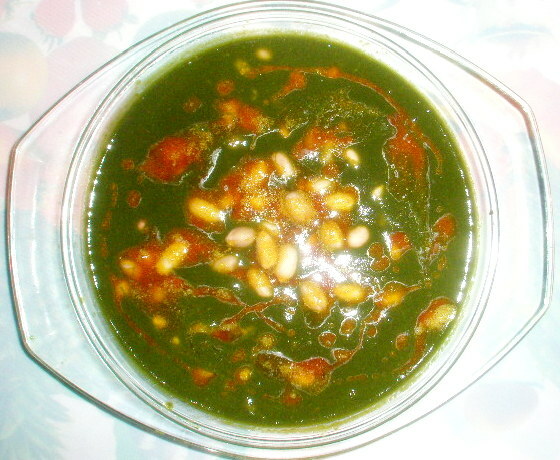 That crunch of peanuts softened as much that you would just have to bite and it would meld with the soft smoky spinach. The taste lasted so long and a thought just crossed my mind. Thought you would agree. Soak peanut for minimum 2 hrs. 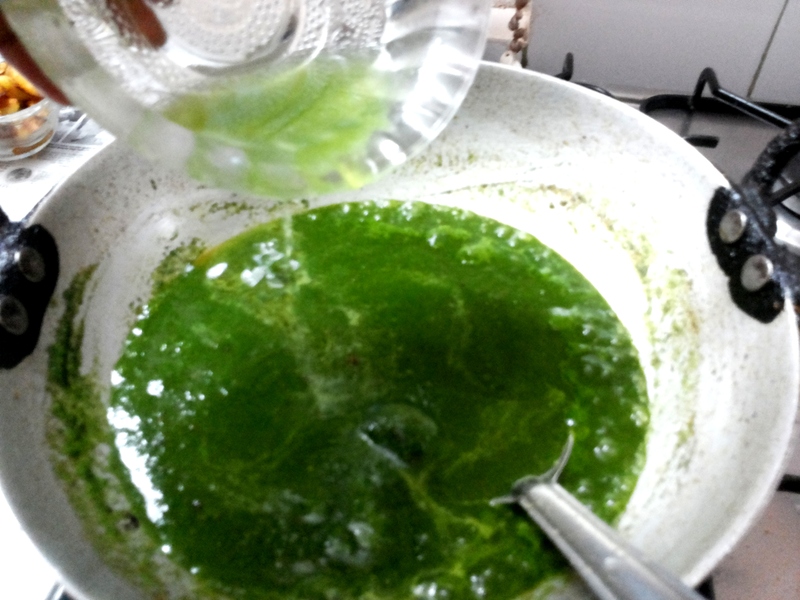 Boil / microwave palak (spinach) for 3 minutes and make fine paste. Grind the onion, 1 tomato, ginger and garlic all together. Boil soaked pea nut with ¼ teaspoon salt in a pressure cooker on high flame. 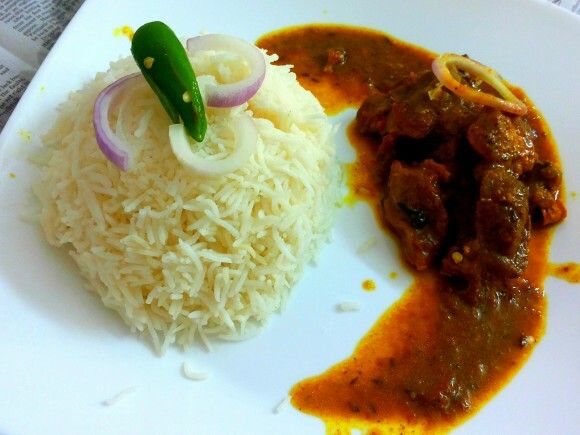 Bring to full cooking pressure, reduce to low flame and cook for 3 minutes. 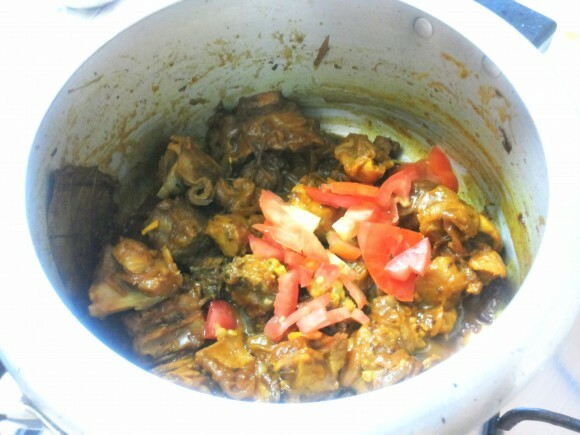 Allow cooker to cool and open. Take a pan. 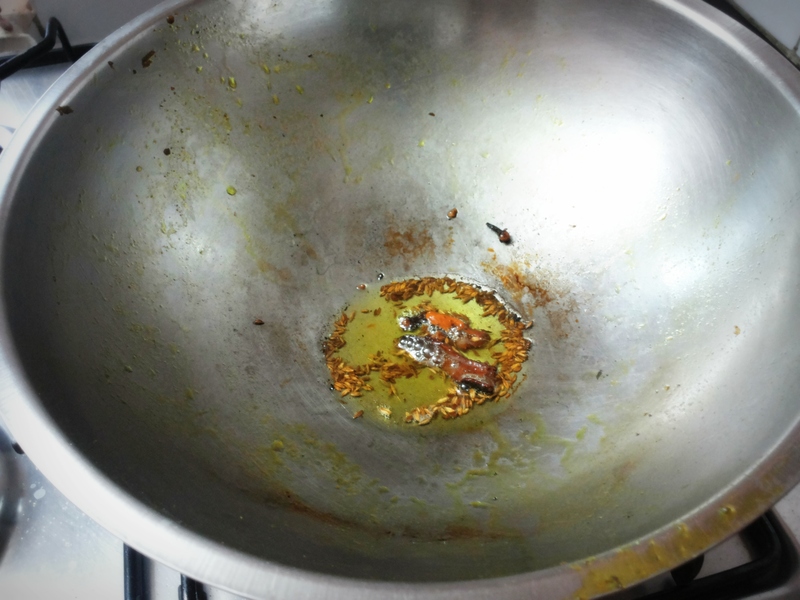 Put oil in a pan, when smoke starts coming, add cumin seed and bay leaf in it. 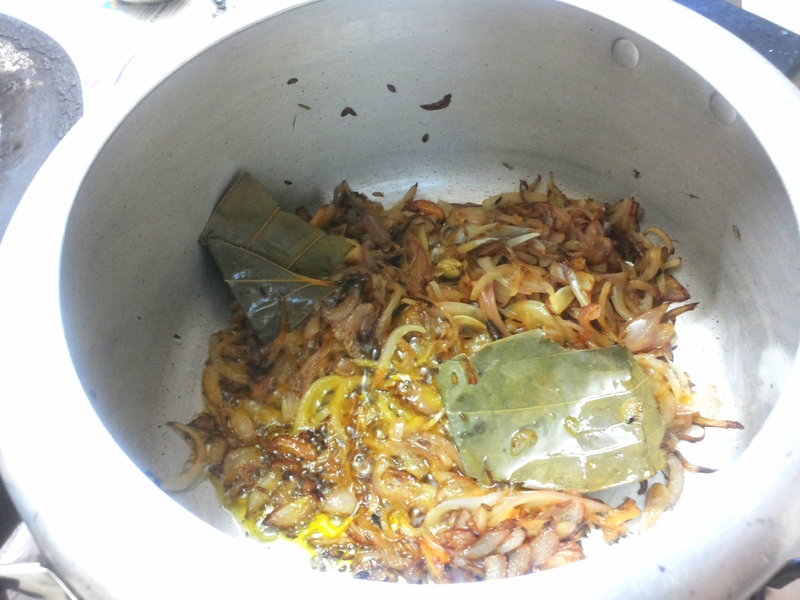 Sputter it for few seconds, add grinned onion, tomato, garlic and ginger paste. 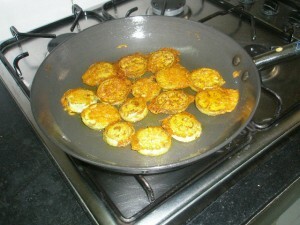 Fry these masala about 3-5 minutes on medium flame. Add red chilly powder, and fry few seconds. 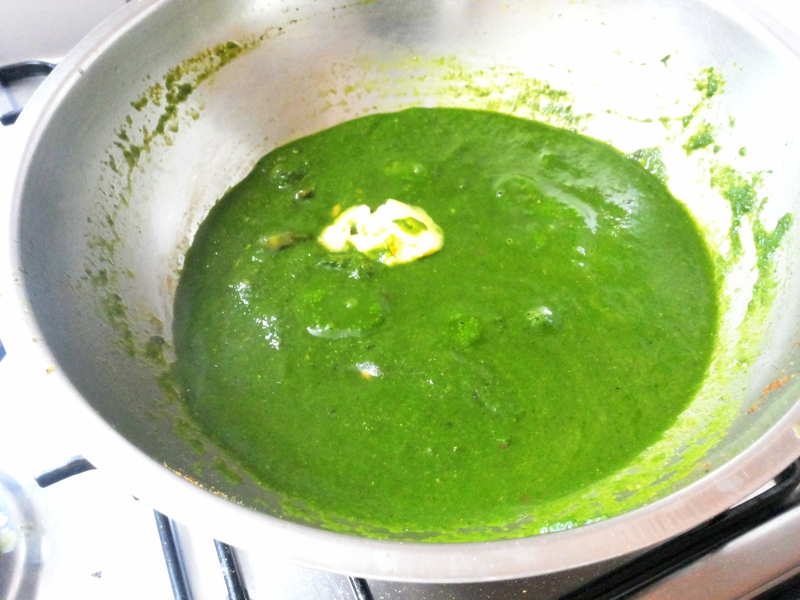 Then add palak paste and ¼ teaspoon salt. Just boil it. Add boiled peanut in it and again boil it. Remove it in serving bowl. Garnish with butter and red chilly (optional). 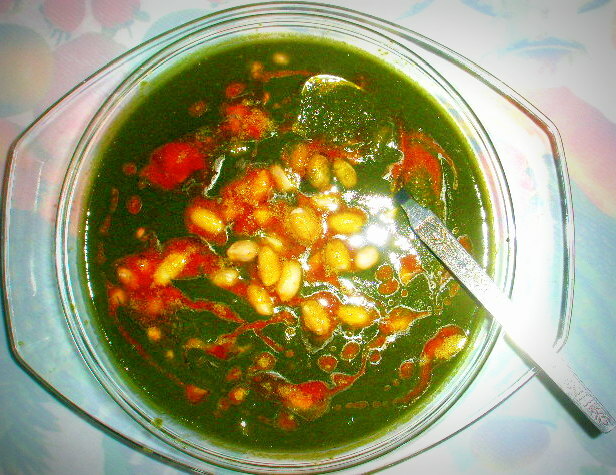 Palak pea nut is ready to serve. 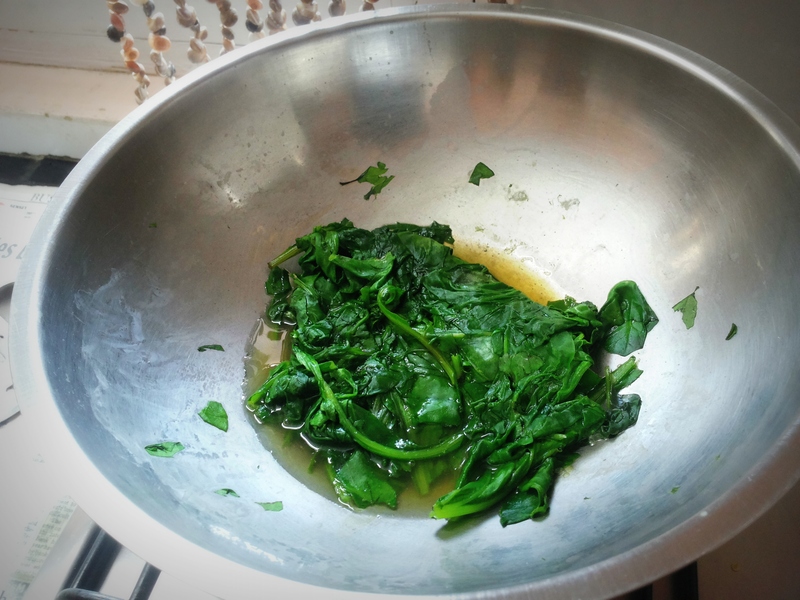 Spinach is a power house of nutrients. It has the best anti-aging and antioxidant properties among all the green leafy vegetables. 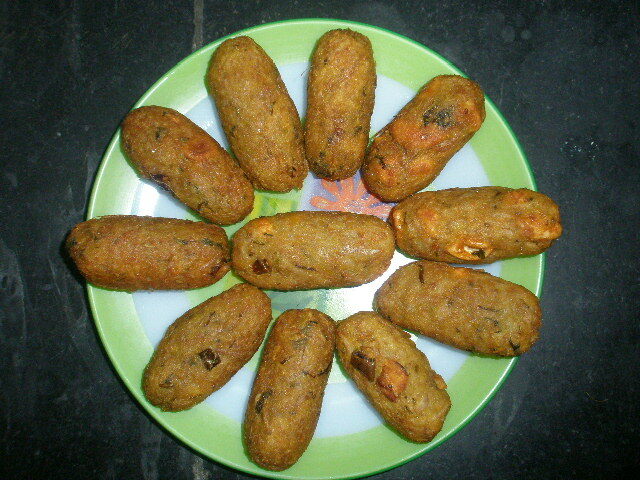 Peanut is rich in protein and vitamin’ E’.